Chemistry: Li-ion Brand: For Makita Model No. 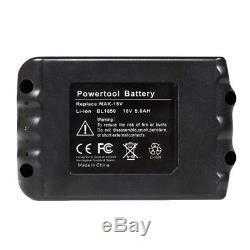 BL1850 Condition: Brand new Sub-Type: Replacement Battery Capacity: 5000mAh Voltage (V): 18V. New and in a good condition. Made of durable and reliable material, harmless to your health. It is easy to use, convenient to carry with. The best replacement for the old or damaged one. A great assistant for electric tools. Provide convenience to charge your electric tool anytime and anywhere. It is suitable for Makita BL1815, BL1830, BL1835, BL1840, BL1850, LXT400, 194204-5, 194205-3, 194230-4, 194309-1. 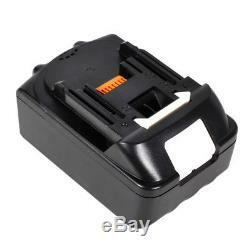 2 x Replacement Battery For Makita BL1850. 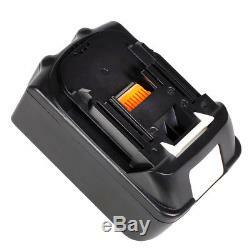 "CTRL"+"F" to find your machine model/part number printed on your machine or original battery. Makita BCS550, BCS550F, BCS550RFE, BCS550Z BCF201, BCF201Z BCL180, BCL180F, BCL180W, BCL180Z, BCL180ZW, BCL182, BCL182Z BDA350, BDA350F, BDA350RFE, BDA350Z, BDA351, BDA351RFE, BDA351Z BDF450, BDF451, BDF451RFE, BDF451Z BDF452, BDF452RFE, BDF452RHE, BDF452SHE, BDF452Z BDF453RHE, BDF453SHE, BDF453Z BDF454F, BDF454RFE, BDF454Z BDF456RFE, BDF456Z BFR550F, BFR550L, BFR550RFE, BFR550Z BFR750, BFR750F, BFR750L, BFR750RFE, BFR750Z BFS450, BFS450F, BFS450RFE, BFS450Z BFS451RFE, BFS451Z BGA402RFE, BGA402Z BGA452, BGA452F, BGA452RFE, BGA452Z BGD800, BGD800RFE, BGD800Z BGD801, BGD801RFE, BGD801Z BHP450 BHP451, BHP451RFE, BHP451SFE, BHP451Z BHP452, BHP452HW, BHP452RFE, BHP452SHE, BHP452Z BHP453, BHP453RFE, BHP453RHE, BHP453SHE, BHP453Z BHP454, BHP454F, BHP454RFE, BHP454Z BHP456RFE, BHP456RFE3, BHP456RFWX, BHP456Z BHR202, BHR202F, BHR202RFE, BHR202RFE3, BHR202RFWX, BHR202Z, BHR240, BHR240Z BHR241, BHR241F, BHR241RFE, BHR241Z BHR242RFE, BHR242RFEV, BHR242Z BHR243RFE, BHR243RFEV, BHR243Z BHS630RFE, BHS630Z BJR181, BJR181F, BJR181RF, BJR181RFE, BJR181X, BJR181X1, BJR181Z, BJR182, BJR182F, BJR182X, BJR182Z BJS101RFE BJS130, BJS130F, BJS130RFE, BJS130Z BJS161, BJS161F, BJS161RFE, BJS161Z BJV180, BJV180F, BJV180RF, BJV180RFE, BJV180Z BL1815 BLS713RFE BML184 BML185 (Flash Light), BML185W BML186 BML800, BML801 BO180D, BO180DRF, BO180DZ, BPB180, BPB180F, BPB180Z BPJ140 BPJ180 BPT351, BPT351RFE, BPT351Z BSS501, BSS501F, BSS501RFE, BSS501Z BSS610, BSS610F, BSS610RF, BSS610RFE, BSS610SFE, BSS610X2, BSS610Z BSS611F, BSS611X, BSS611Z BST221F, BST221RFE, BST221X, BST221Z BTD140, BTD140RFE, BTD140SFE, BTD140Z BTD141, BTD141Z BTD142HW, BTD142RHE, BTD142SHE, BTD142Z BTD144, BTD144RFE, BTD144Z BTD145RFE, BTD145Z BTD146D, BTD146RFE, BTD146SHE, BTD146Z BTDW251Z BTL061, BTL061F, BTL061RFE, BTL061Z BTL063, BTL063F, BTL063Z BTM50, BTM50RFE, BTM50Z BTP140, BTP140F, BTP140RFE, BTP140Z BTP141, BTP141RFX2, BTP141Z BTW251, BTW251F, BTW251FX1, BTW251RFE, BTW251X, BTW251Z, BTW251ZX1 BTW253, BTW253F, BTW253RFE, BTW253Z BTW450, BTW450F, BTW450FX1, BTW450RFE, BTW450X, BTW450Z, BTW450ZX, BTW450ZX1 BUB182, BUB182F, BUB182Z BUC122RFE BVC350Z BVF154RF BVR350, BVR350F, BVR350Z BVR450, BVR450F, BVR450RFE, BVR450Z BVR850, BVR850F, BVR850Z CF201DZ, CF201DZW CL180FD, CL180FDRFW, CL180FDZW CL182FD, CL182FDRFW D145DRFX DA350DRF DF454D, DF454DRFX, DF454DZ DF458DRFX, DF458DZ GA402DRF, GA402DZ GD800DRF, GD800DZ HP451RFE HP454D, HP454DRFX, HP454DZ HP458DRFX, HP458DZ HR202D, HR202DRFX, HR202DZK HR242DRFX, HR242DRFXV HS630DRFX, HS630DRFXW, HS630DZ, HS630DZW JR120D, JR120DRF, JR120DZK JR182DRF, JR182DZK JV180DRF KP180DRF, KP180DZ LXCV02Z, LXCV02Z1 LXDG01, LXDG01Z, LXDG01Z1 LXDT01, LXDT01Z, LXDT01Z1 LXDT04Z, LXDT04Z1 LXDT06Z LXFD01, LXFD01CW, LXFD01Z LXLC01, LXLC01Z, LXLC01Z1 LXLM01W LXPH01, LXPH01C1, LXPH01Z LXPH03Z LXPH05, LXPH05Z LXPK01, LXPK01Z, LXPK01Z1 LXSF01, LXSF01Z1 LXSL01, LXSL01Z, LXSL01Z1 LXTP01, LXTP01Z, LXTP01Z1 LXWT01, LXWT01Z ML184 (Flash Light) ML185 ML800 ML801 MR050 MR100, MR100W MUH263DRF, MUH263DZ MUH401DRF, MUH401DZ MUH461DRF, MUH461DZ MUM168DRF, MUM168DZ MUR181DRF, MUR181DZ MUS104DSH, MUS104DZ MUS154DSH, MUS154DZ PB108D, PB108DRFX, PB108DZ, PB180DRFX PJ180DRF PT351D, PT351DRF, PT351DZK SC162DRF TD140D TD144D, TD144DRFX, TD144DZ TD145DRFXB, TD145DRFXL, TD145DRFXP, TD145DRFXW TD146DRFP, TD146DRFX, TD146DRFXB, TD146DRFXL, TD146DRFXW, TD146DZ TD147DRFX, TD147DZ TD251DRFX, TD251DZ TL061DRF TM50DRF TP140DRFX TP141DRFX, TP141DZ TW251D, TW251DRFX TW450DRFX UB182D, UB182DRF, UB182DZ UB183D UC122D VR350D, VR350DRFX, VR350DZ VR450D, VR450DRFX, VR450DZ. Or your machine model NO. 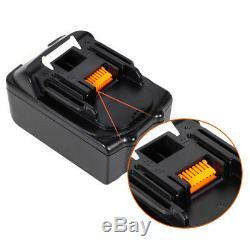 Are not listed in the description, our battery may still fit your machine. It's a safer, faster and free way to pay! We are not responsible for wrong or undeliverable address. It is our goal to provide our customer 100% satisfaction. We have always been trying our best to provide the best service and reliable products for every customer. 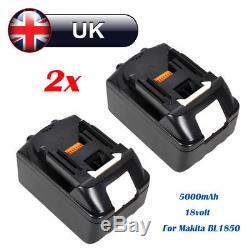 The item "2x 18V 6.0Ah Lithium ion Battery for Makita LXT BL1850 BL1840 BL1830 BL1860 UK" is in sale since Tuesday, June 26, 2018. 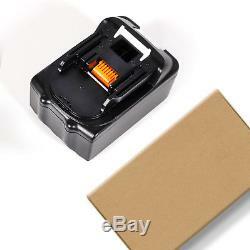 This item is in the category "Business, Office & Industrial\Power Tools\Batteries & Chargers". The seller is "gobletopshop" and is located in Salford, Greater Manchester. This item can be shipped to United Kingdom.